Instant pot vegetable biryani recipe with paneer and mixed veggies is so delicious and so easy to make. You can prepare this even more easier if you cut the veggies in advance or get store bought frozen or fresh sliced veggies. If you have paneer, long grain white basmati rice and mixed sliced vegetables at home (and spices needed for the biryani) you can easily make this instant pot vegetable biryani with paneer and veggies at home with minimal efforts. This instant pot veggie biryani with paneer is perfect for any potluck with friends, family gatherings or dinner where you want to prepare an Indian main course vegetarian dish using the instant pot. 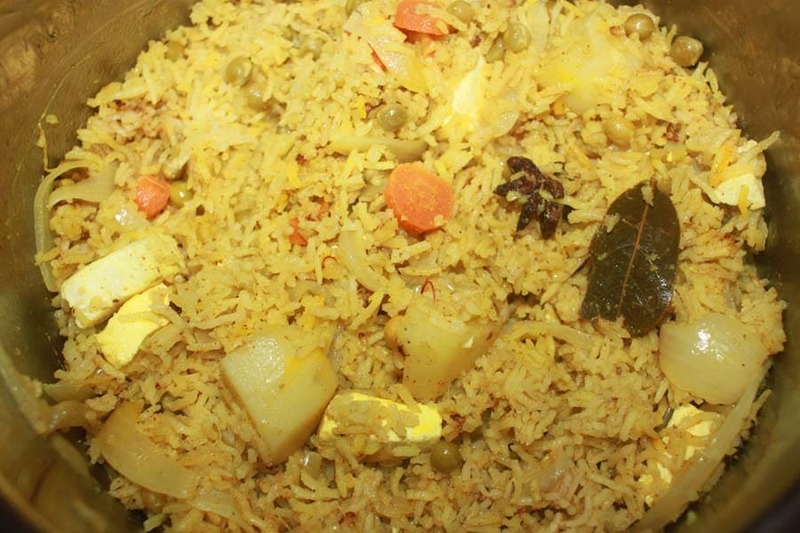 Just follow the instructions in the recipe card and you will have yummy vegetable biryani if few minutes of time. If you love to try this instant pot biryani recipe, also check out this easy instant pot veg pulao recipe, easy instant pot peas pulao recipe, easy instant pot tomato rice recipe, instant pot coconut rice with dal, instant pot cilantro lime rice etc which are all very easy, simple and delicious instant pot rice recipes. I also have this easy instant pot palak paneer recipe here if you want to try more instant pot paneer recipes. The flavor of the biryani will greatly depend on the quality of the ingredients used, so always make sure to use fresh vegetables, spices and good quality rice for the briyani. Its always best to use long grain basmati rice for homemade biryanis, here is my favorite basmati rice for biryani, if you wish to buy it online. So here is how you can prepare easy and delicious vegetable biryani in instant pot using mixed vegetables, paneer, rice and spices. 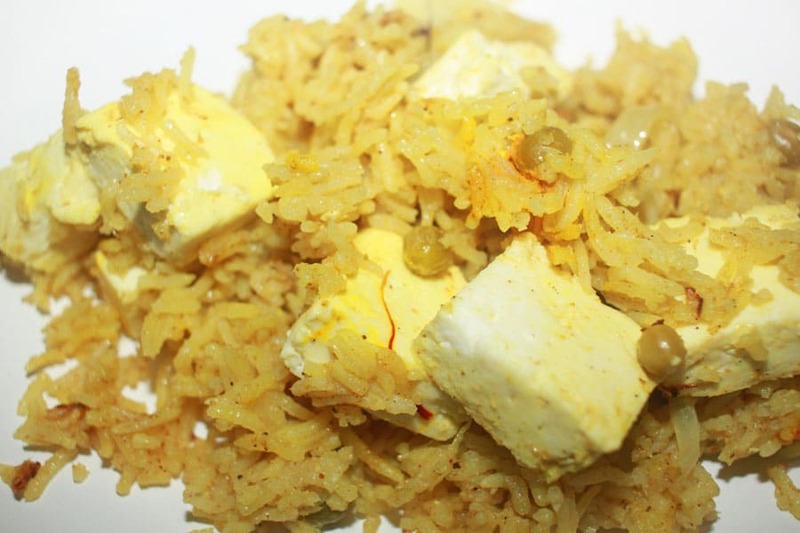 Biryani with paneer and mixed vegetables is delicious and rich, it makes a very comforting and filling Indian style vegetarian meal for lunch, dinner, gatherings with friends and family, potluck, party etc. And it is much easier to make using the instant pot! Wash the rice very well in water for two to three times and soak the rice in enough water for about 15 minutes. After soaking, discard the water used for soaking, rinse well and keep the rice aside. Transfer the chopped veggies to a bowl and add the yogurt, enough salt and spice powders, mix everything well so the vegetables will get mixed with the yogurt spice blend. Keep this aside at least for about 10 minutes (or for some more time) so the flavors will blend with the vegetables. Slice the onions into thin long slices, keep aside. Add one tablespoon of ghee to the instant pot, press the saute function, adjust to low and add the cashews, lightly fry the cashews until light golden brown. Transfer the fried cashews to a bowl, keep it aside. Add one more tablespoon of ghee to the instant pot and add the whole spices, lightly fry for a few seconds. Add the chopped onions, add salt and saute for about 7 to 8 minutes or until the onions are lightly browned. Stir well and you may adjust the heat as needed by pressing the cancel button, and then press the saute button and use the adjust button to change the heat settings. As the onions get sauteed, make sure to stir often to avoid the onions burning at the bottom of the pot. Once the onions are lightly browned, transfer half of the sauteed onions to a bowl (you can keep it along with the fried cashews) and keep aside. Add the ginger garlic paste, stir well and saute for another couple of minutes. Add the veggies in yogurt spice mixture to the pot, mix well and saute in low for another 2 to 3 minutes or until the veggies are lightly sauteed and the yogurt mixture is almost absorbed. You may adjust the heat and stir fry the contents for another couple of minutes if needed so the yogurt mixture is almost absorbed to the contents make sure to stir as needed to avoid the contents sticking to the bottom of the pot. Press the 'keep warm/cancel button' so the saute function will be stopped. Add the one tablespoon of oil and rice to the pot, and also add enough salt and mix with the veggies. Add the water and mix very well again, make sure there is water at the bottom of the pot. Place the paneer cubes on top in a single layer. Sprinkle little salt over the paneer cubes. Close the pot with lid in sealing position, press the manual button and cook in high pressure for 6 minutes.The pot will take few minutes to build up the pressure and start the cooking, once the cooking is done, it will beep. Once the cooking is done and the pot beeps, press the 'keep warm/cancel' button and wait for the instant pot to naturally release the pressure for about 10 minutes. Meanwhile, add the saffron strands to the warm milk and keep it aside (the saffron will dissolve in the milk giving the milk a light golden yellow color). After 10 minutes of NPR (natural pressure release), manually release the pressure very carefully by slowly turning the lid to venting position releasing the pressure gradually. Once the pressure is all released, open the lid carefully. Sprinkle the saffron milk to the prepared biryani, close the lid again and let it sit for about 2 to 3 minutes. 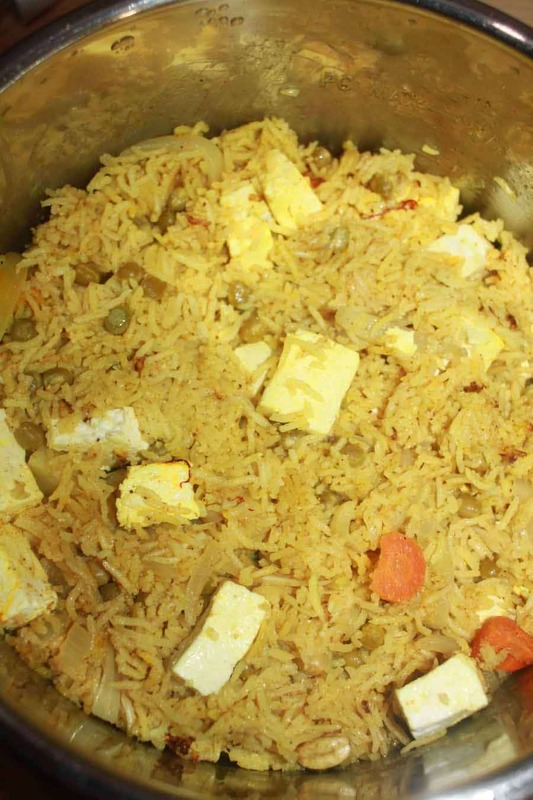 After 2 to 3 minutes, open the lid, mix in the contents so the paneer will also get mixed with the rice evely. 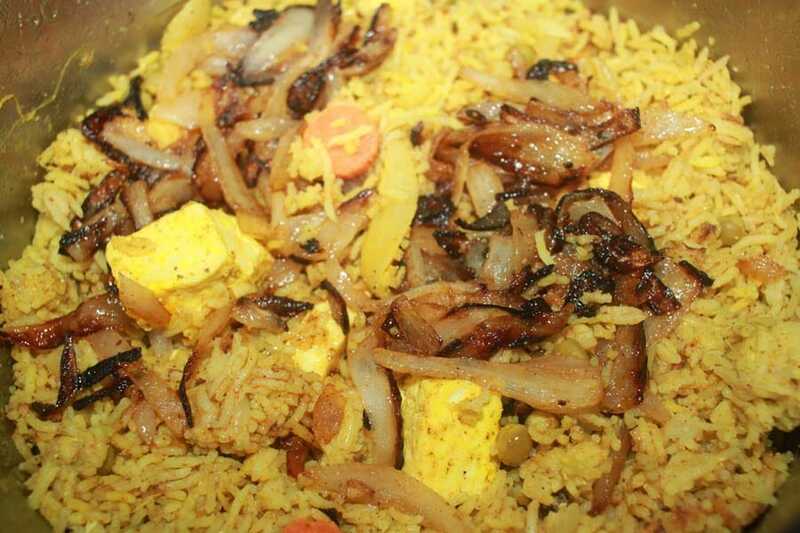 Finally add the fried cashews and onions, gently mix with the rice, serve the delicious biryani hot! You can serve it as it is or you can serve it with yogurt, raita, any pickles or curry as you like. 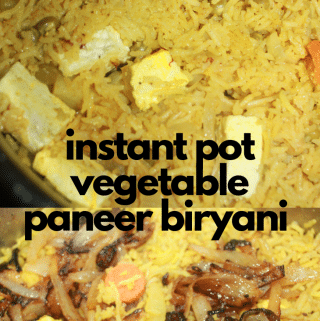 Hope you found this post on instant pot vegetable biryani recipe with paneer and vegetables easy and helpful in making easy, delicious biryani at home using your instant pot!